As Rahm Emanuel sorted out his Chicago residency bona fides early this year, East Village Association leaders started to weigh what makes someone part of the neighborhood. 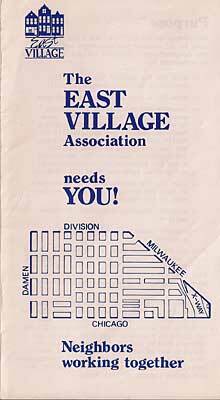 If members agree in April, EVA voters must be East Village residents or property owners. They won't need to pull a wedding dress from their crawlspace as proof. The idea is that while anyone can support East Village, only those directly affected should cast ballots on community issues. Residency comes up often in connection with EVA votes because it has not been a requirement. Anyone who identifies with the neighborhood may (and should) join  I signed up as an Oak Parker searching the real-estate listings. But I couldn't vote immediately, because a monthlong cooling-off period was in place to discourage single-issue voters. Often newcomers arrive with development interests before the group. Votes for such things as zoning changes and special land uses are intended to advise the alderman on neighborhood sentiment, and their authority would be tarnished by participants still unfamiliar with the surroundings. EVA took another look at the rules when people who had not yet been added to the member spreadsheet showed up Jan. 3 ready to vote on a Chicago Avenue rooftop cafe for Bleeding Heart Bakery, briefly delaying an announcement of the tally. The board reviewed member Aaron Bilton's proposal on Feb. 15 and circulated amendments over the next three days. The change would limit voting privileges to residents and property owners who have been members at least three months, a span chosen both to make election rolls easier to compile and to assure that voters will have settled into their new territory. "I don't think it unfair that we ask those who have not actually invested within our area to invest some time to become part of our community," Bilton suggested. "The people that we are looking to include will not be that put off by missing one vote if they truly want to become part of our community." Also at issue were members with the potential of voting twice, either those who belonged to two neighborhood groups debating the same issue or those holding both family and business memberships. And since a strict reading of the bylaws would have required everyone voting Jan. 3 to have paid both 2010 and 2011 dues, the proposal gives the board discretion in dues collection dates. The resolution rewrites East Village Association bylaws, but keeps the neighborhood bound by Division Street and Milwaukee, Chicago and Damen avenues. Be it resolved that the By-laws of the East Village Association be amended as follows: Delete preamble of Article IV; delete last two sentences of Article IV Section 2; amend first sentence of Article VI to read: "Only members in good standing over 16 years of age who reside or own property in the area defined in Article II and who have been members for a minimum of three months are eligible to vote. Add at end of section: "No person may cast more than one vote." Has anyone considered confirming the boundaries as above, but expanding a buffer zone for voting? It seems a little capricious that someone just west of Damen on Augusta, or just south of Chicago on Paulina or Wolcott wouldn't have a say, even though this is clearly their neighborhood. A buffer zone was part of the original proposal but the board ultimately settled on our clearly defined boundaries. EVA frequently works with adjoining groups such as Ukrainian Village Neighborhood Association and Chicago Grand Neighbors Association. How does working with those groups actually...work? Even with Chicago Bowl and Roots/Bleeding Heart, the EVA vote seemed to be the critical one, even though both bordered on the EVA boundaries. I realize the new residency rules weren't in place for those, but I agree with A-1 that some sort of buffer might be a good idea. How it works is that if there's an issue outside your borders no one asks you what you think. Maybe that's an argument for extending the borders. I am on the south side of Chicago Avenue. Am I not part of East Village? bleeding heart and chicago bowl are both across the street from me, but I don't get to vote?! ?